Ever since I spent some time in Sweden I can not stop baking traditional Swedish delights! So of course I had to bake on Santa Lucia, which is celebrated in Sweden today. 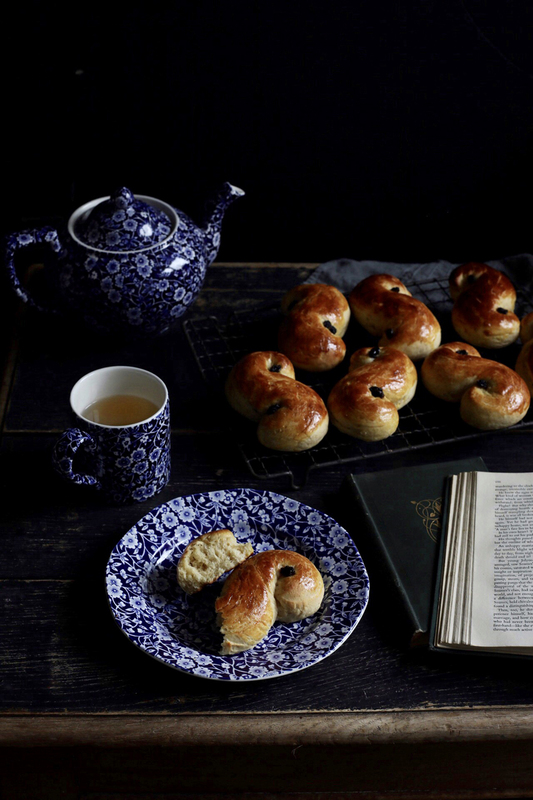 They go by a few names: Lussebullar, Lussekatt, Lussekatter, St.Lucia bullar and plain old saffron buns. According to tradition it is the eldest daughter of the family who is in charge of baking these buns. Santa Lucia is the christianised pagan feast of the winter solstice. Today is the darkest day of the year and therefore light has to be celebrated and cherished. Before christianisation the Nordic people would celebrate the goddess Frigga or Freya and her awakening from the tree in which she was hiding with her child Baldur. This marks the shortest day and the moment in which the days will start to lengthen again. For pagans today is christmas….